Magician Essex - Close up magic in Essex. Stage show mind reader. Looking to Hire a Magician in Essex? Essex magician and mind reader Edward Crawford has been performing his close up and cabaret act throughout Essex for the past 15 years. The London Standard described Edward as the perfect guest at any high class gathering. Whether performing as an Essex magician at corporate events, Christmas parties, banquets, balls, or Weddings, Edward’s performance is the perfect entertainment for any event. Edward is one of just a few full time professional magicians working in the UK so whether you are after an Essex Magician for close up magic, a stage show or a dinner show Edward will have the perfect act to make your event unforgettable. Edward’s act is considerably more than your standard magic show. He specialises in demonstrating the amazing power of the human thought. Using influence, psychology and deception, Edward will read minds, influence the present, predict the future, and on occasion, will demonstrate feats of psychokineses (moving objects with the mind). It really needs to be seen to be believed. No camera trickery, everything will be performed directly in front of you. Think of an old school friend, Edward will tell you their name and what they looked like. Draw a picture, open the envelope Edward handed you before you started to draw, it’s an identical image. Take a coin out of your pocket and watch it bend! All these and more can be witnessed both in his cabaret show and in intimate close up performances. If you would like to book him for your event in Essex simply fill in the enquiry form below. Whether you require a Essex Magician for close up performance at a dinner or drinks reception, or a cabaret /stage show, Edward will tailor his act to suit your event. You are being talked about in the office constantly this morning. I really am thrown by the performance you did with John and myself, I have no idea how it worked but it certainly did. I have no doubt we will all be talking about you and recomending you to friends and colleagues. Thank you again and I hope to be entertained by you again in the future. Last week I was hired to perform close up magic in Essex at a 40th birthday party in Hornchurch. The client required a close up magician to mix and mingle with her guests at a casual drinks party. June and July are the busiest time of the year for weddings and this week alone I’ve performed at 4 of them. Thankfully it has become more popular, and cheaper, to have weddings on week days which means it’s not just Saturdays I have wedding bookings. On Wednesday I was booked to perform close up magic in Essex at the wedding of Luke and Victoria at Parklands Quendon Hall. I was booked to perform throughout the drinks reception after the ceremony (the ceremony took place at the venue). This is without a doubt the most popular period to perform at a wedding, it’s generally a bit of a dead time for a lot of people as photo’s are being taken and for those not included they may find themselves standing around aimlessly. Performing close up magic at a wedding in this period is also an excellent way to bring together people who haven’t met previously. Having your mind read is something you’re going to want to discuss with other people! As ever with weddings everything was running a bit late and the bride and groom were being dragged from place to place to have photo’s taken and I didn’t get the chance to perform for them during the drinks reception. As they had requested a performance and it was their big day I stuck around later than the time I was booked and performed for 30 minutes into the wedding breakfast. During this time I performed a special routine for the bride and groom. By this point everyone was asking me to come to their table and show them something else so I ended up staying another 30 minutes only leaving when I realised I had to get to an evening booking in London. “Thank you for such an entertaining and thought provoking evening. The entertainment that you provided worked beautifully with our friends and in a dinner party setting. We had a chance to catch up with everyone, yet also have the inclusion of additional conversation by what we were observing. Your ability to interact with a new audience also made it a very relaxing evening. Everyone thoroughly enjoyed themselves. On Saturday night I was hired to perform close up magic At The Canvey Island Yacht Club for a joint 60th birthday party. The event was a very casual drinks party. These are generally the easiest of events to perform at. People are relaxed and up for fun and it is always a delight to mix and mingle with people and read their minds! I performed for about two hours going from group to group performing a 10 minute routine each time. This way I manged to perform for each group of people 2 or 3 times. For the first routine I would start with something very simple to get an idea who I could work with easiest. I might ask people to think of a 2 digit number, I would then tell them what they were thinking of, this would then go onto asking someone to think of their PIN number, which I would reveal (secretly)! When I returned to each group I would take things further and delve further into their minds revealing thoughts, name sand places that meant things to people. The whole evening was a lot of fun and the party goers seemed to love my performance. Huge thanks to Maureen, Les for the booking. If you’re after a close up magician in Essex for your party please get in touch. Last weekend I was hired to perform during the wedding breakfast of a wedding at Maiden Barn in Essex. This is probably my favourite time to perform at a wedding as I have everyone seated on one place and everyone is very relaxed and up for some entertainment. I performed for 2 hours going from table to table, each table would have a 10 minute performance at a time. At each table I would read minds and predict the actions of the guests. I also tired out a new routine which includes a mild hypnotic induction in which the person participating loses the strength to lift light items off a table and ultimately finds the strength to bend a solid steel nail. A lot of fun to see something I have been working on for months work very successfully. 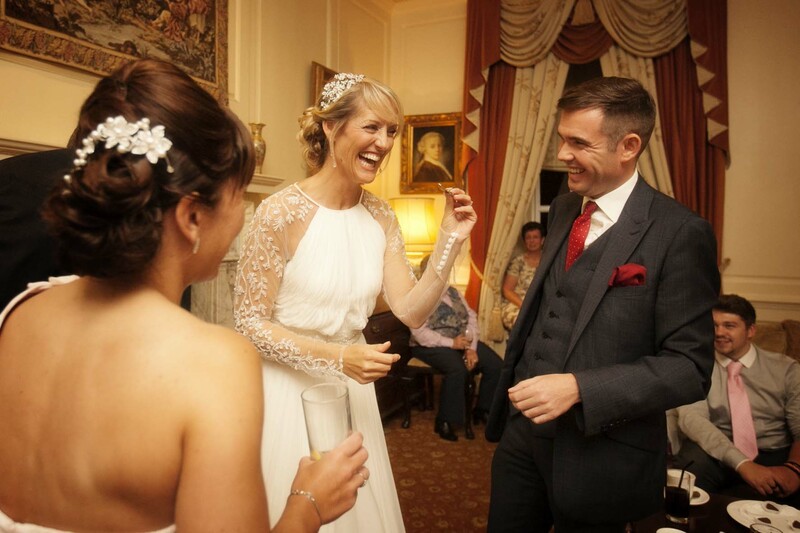 If you are after a wedding magician click HERE for more details. To hire a magician Essex contact Edward today.